One of the great constants about TV technology is that every year the engineers improve the picture quality, especially in the top of the line models like Samsung's H8000 series. The problem as a reviewer is that you begin to run out of superlatives about the video performance. How much bigger, brighter, and more colorful can the picture be? Let me just say that as I was sampling a few of my favorite Blu-rays on this curved Samsung 55H8000 HDTV, I felt like I was seeing them for the first time. The color palette seemed fuller without a hint of artificiality. Of course, this Smart TV is loaded with apps and Internet content providers. And you can boss the TV around with voice commands. But for me, it's that lovely picture that earns my admiration. Before I proceed, I need to comment on what Samsung is marketing as "The Curve Changes Everything." 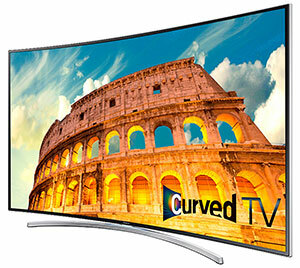 Indeed, the Samsung UN55H8000AFXZA is a curved TV and the first arched model that I have reviewed, which gives me an opportunity to discuss the theory and reality of curved displays. To begin, the screen only arcs slightly. If you set a group of these 55-inch curved TV's edge to edge, it would take about 21 of them to form a circle. Even so, Samsung states "The proprietary heliocentric technology provides optimal peripheral vision with a clearer view of the entire image from every angle...that creates a panoramic effect and helps the picture feel bigger." I can buy into the theory of a clearer view, but at least with this 55-inch screen, I can't perceive it. Though, I will admit that the curved screen does slightly alter your perspective. Whether that makes the picture feel bigger, let's just say it's different and that's not necessarily a bad different. I would like to see a larger display, maybe 70-inches or bigger, with more of a curve that would wrap farther around you. Then I think we could talk seriously about a panoramic effect. Be that as it may, the Samsung 55H8000's curve is definitely cool as a sliced cucumber. The profile will garner second looks from friends and family. If this rating was solely for video performance, I would gladly give this UN55H8000AFXZA five stars. No doubt, some exacting videophiles might find fault here or there, but the great majority should be able to dial in a highly pleasing picture. The deduction of half a star can be attributed to the audio performance, which is quite acceptable but simply can't match the standard set by the video. Almost all of the features that Samsung packed into last year's top of the line models are returning in the H8000 series, built-in Wi-Fi, a bevy of apps, voice recognition, 3D, Bluetooth, MHL and ARC support. The major missing component is an integrated video camera for Skyping and controlling the TV by hand motion. Since I'm not a big fan of the current state of motion control, it's not missed. If you plan to squeeze full value out of all the features, then it will take some time and effort for you to study the TV. Thankfully, the redesigned Smart Hub makes navigation simpler. 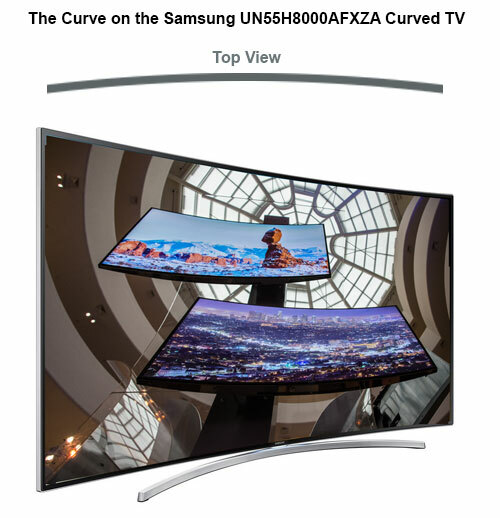 On their website, Samsung lists the suggested price for this 55-inch UN55H8000AFXZA Curved HDTV as $2899. At that number, you are definitely paying a premium for being the first one on your block with a curved TV. With the $600 price cut that Samsung is currently offering online, some of that first adopter sting is salved. Of course, if you are not a curve convert, you can find many fine, feature-rich, 55-inch, old fashioned flat panel HDTVs for less than $1500.